Tonight I took a torch out to see the Manx Shearwater that arrive under the safe cover of darkness on Skomer during the breeding season in their hundreds of thousands. 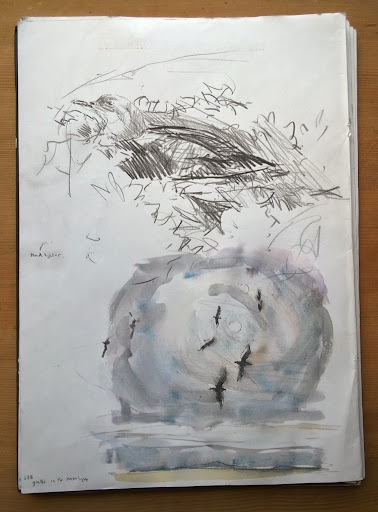 As it fell completely pitch dark at around 11pm the Manxies began to arrive, a trickle at first like falling meteors rushing over my head then a storm of wings crashing out of the sky, and appearing instantly on the path in front of me. They are majestic in flight when I have seen them skimming the waves in Cardigan bay , but on land they flip and flop like fish out of water on account of their short legs, useless for walking. They creep into rabbit holes and the whole subterranean network soon echoes with the peculiar cackling, mewing sound of their birds safe below ground. 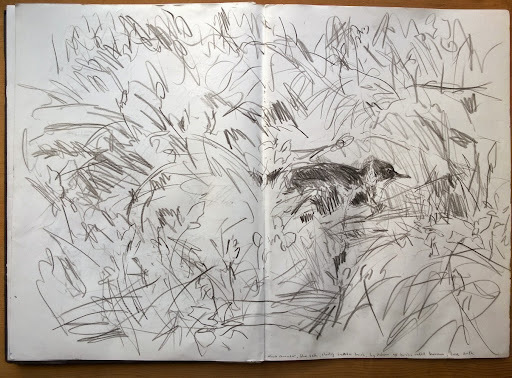 Others unable to find a hole crouch motionless and silent amongst the bluebells, their inability to walk making them easy pickings for gulls as their numerous remains attest for. 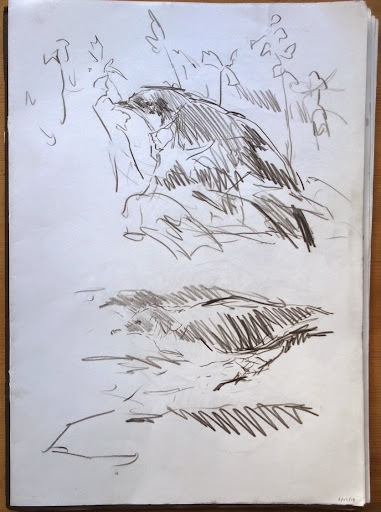 I shine my torch on the birds and draw them very quickly, imagining the long exhausting journey that has brought them here, the reluctance to be in this uncomfortable environment rife with horrible danger.